Our inquisitiveness to explore the 'Baramahal or the '12 forts' only increased with every passing minute and led us towards the fort at Jagadevi. 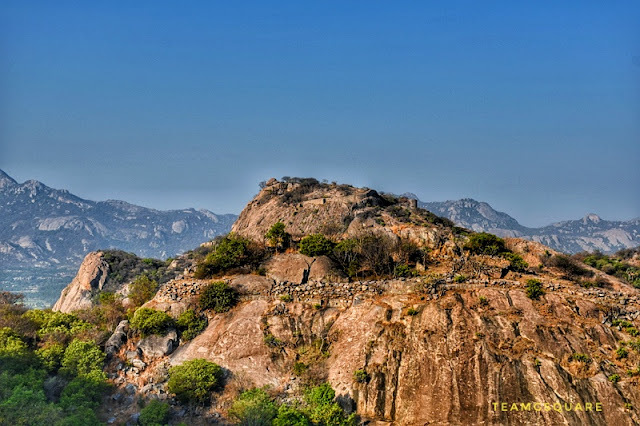 The Jagadevi/Jagadeo/Jagadevu Fort is believed to be the second capital of Baramahal along with Krishnagiri. However whatever information is available on the internet regarding this fort seems to be incomplete. We had read about the fort at Jagadevi being a small one and built by Tippu Sultan which seems to be inaccurate information owing to what we witnessed here. Jagadevi fort is quite considerable and spread across 2 hills with most of its fortification being intact. We were also excited to find 2 inscriptions engraved in Kannada, giving details about the King Raja Raja Sri Jagadevaraya and Jagadevu durgam. Thus making it clear that this fort was built much before Tippu Sultan's reign by King Jagadevaraya. King Jagadevaraya was a feudal king under the patronage of the Vijayanagara king Venkatadri of Aravidu dynasty. His ruling period can be assigned to 1570 - 1615 C.E and he is said to have brilliantly defended his kingdom against Ibrahim Adil Shah during the war of Penukonda. There are many interesting stories related to this war. 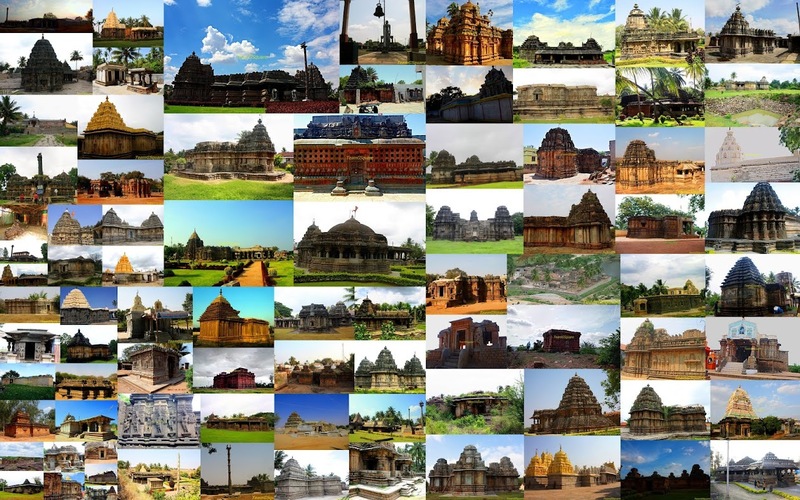 Although the Krishnagiri government website mentions about a Hoysala king Jagadevaraya, none of books we have related to the Hoysalas carry any information about the same. A further research about him revealed that he belonged to Channapatna which was also his capital city. He was one of the strongest Palegars of this region and sadly with none of his successors being strong enough to maintain the kingdom, it eventually came under the control of the Wodeyars of Mysore around 1630 C.E. King Jagadevaraya belonged to the Telugu Banajiga sect and even today people belonging to this sect are referred to as Kote Banajigas or Musku Banajigas. Tippu captured this fort from the Wodeyars which was later seized by the British in 1792 who later abandoned the fort. 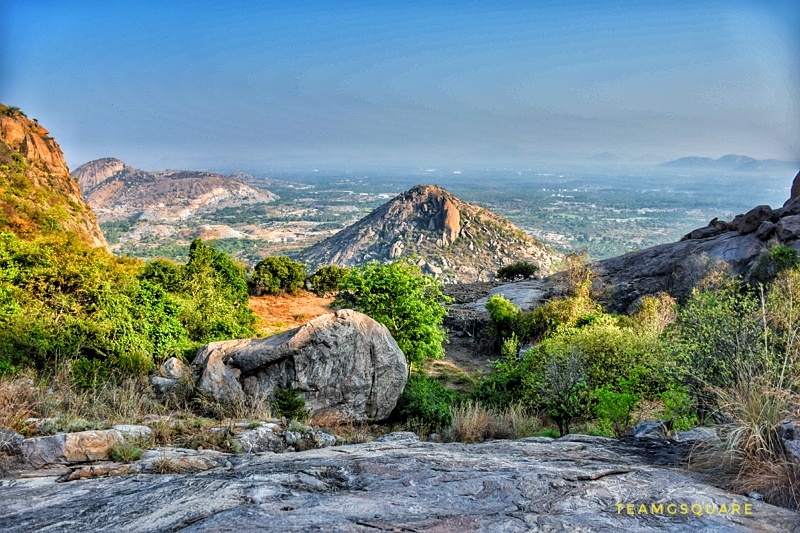 The Hoysalas at one point ruled the entire region of Krishnagiri along with Dharmapuri and other surrounding areas. Why Fear When I'm Here Appa! We were keen on exploring this fort and on the last Sunday we decided to do so. Meanwhile our companion Sanidhya expressed his interest to join in for the trek along with his 2 friends Harshal and Ankitha. We started quite early in the morning with an intention to complete the trek before the weather turned extremely hot. We reached the base of Jagadevi Fort at around 6:30 am and inquired about the route to the fort with a local. We parked our vehicles under the shade of a tree which was quite a blessing, thus beginning our quest to explore the unexplored! The initial stretch of the climb has rock cut steps carved out recently and leads us to Sri Netrikan Selva Vinayakar temple. 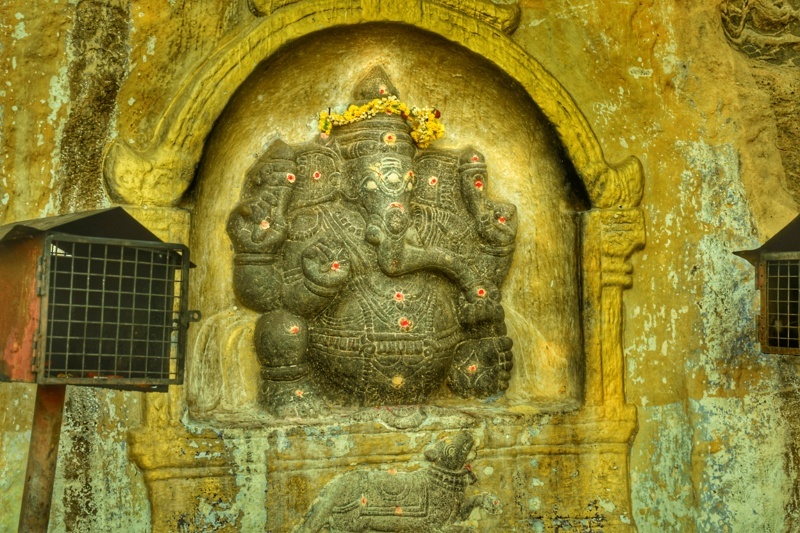 There is a beautiful and unique carving of Lord Ganesha here who is seen with 3 eyes. This is quite rare and reminded us of Sri Kumbhi Ganapathi of Huliyurdurga. A little further is the Sri Kote Anjaneyaswamy temple. The route hereon turns less conspicuous and interesting. As we entered the third tier of the fort, we got a clear picture of how big the fort is. We sighted fortification spread across the 2 hills at many sites. As we walked around inspecting the area, we found a Kannada inscription on the rock. We rested here for a while trying to decipher the script. As we trekked further, we found fortification on both sides of the hill with the left peak dominating. We changed our initial plan of exploring the right peak first and headed towards the left. The climb was steep and slippery at a few places. We reached the fort entrance which was in complete shambles. 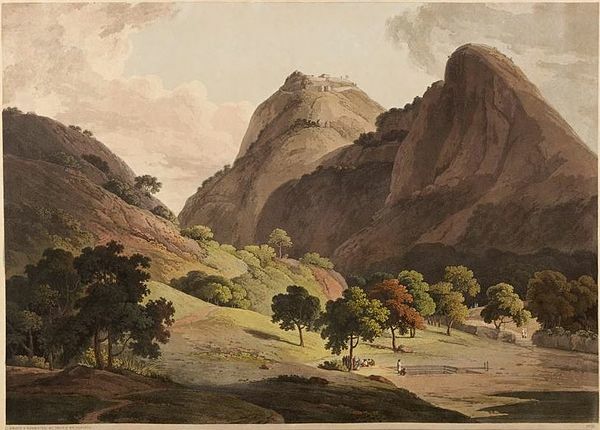 I could relate the scenes from here to the painting of this place from Oriental Scenery (Thomas Daniel and William Daniel) which mentions about two forts, Jagdeo and Warrangur in the same painting, probably having mistaken the fortification on the other peak to be that of Warrangur fort. We climbed up till the cannon point of the fort. However there is no cannon present now. The view from here is magnificent as we could spot the other hill forts of Periyamalai, Thattakal, Kondappanayakempalli, Krishnagiri and many others. We rested for a while at this point and had snacks. After sometime, we continued further on to reach the next higher level of fortification where there was a small natural water pond (Dhone). It was good to see so much water in which a snake seemed lying dead. It was quite a long one accompanied by another little snake. Though it remained still for a while, it swam into the waters as soon as it felt disturbed due to our movement. There were many tadpoles and a few small fishes too. A little ahead of this pond was a ruined structure resembling a palace. Though the walls of the palace remain damaged considerably on three sides, it seemed obvious that this place was used as a residence for the Royal's. We stumbled upon another fort gateway which probably was the entrance to the original route. We spotted a large pond here which had turned almost dry, but surprisingly had ensured that its surroundings remained green. During our descent, we found a second Kannada inscription that clearly mentions about Raja Raja Sri Jagadevaraya and Jagadevu durgam. As we descended further, we came across a lush green patch which was home to many birds including the very colorful woodpeckers. We spotted many varieties of birds among which were the yellow throated bulbul, green billed malkoha, fly-catcher and other common birds. While descending, we decided to clean the plastic trash from this place. Though the fort area and its surroundings had very less or literally no plastic, the areas in front of the temples of Sri Anjaneyaswamy and Lord Ganapathi were totally littered with plastic and paper. We collected and carried as much as trash possible. Thus ending our quest of Jagdeo/Jagdevu/Jagadevi. With this quest, we have covered 7 out of the 12 forts that constitute the Baramahal! It was unfortunate to witness the rampant quarrying in the immediate vicinity of Jagadevi fort. This fort does not come under the limits of the ASI and is maintained by the Tamil Nadu State Archaeology Department. Some amount of restoration work seems to have been carried out initially, but now is left to the mercy of god. Glad to know about this fort. Wonderful views from the top. Thank you for the history of this fort and for the wonderful pictures you've shared. I'm glad you were able to make the trek. It's too bad that there is quarrying going on so near this fort. I hope it can be preserved.